Acquisition of invasive/metastatic potential through protease expression is a key event in tumor progression. The proteolytic enzyme plasmin is generated from the precursor plasminogen by the action of urokinase-type plasminogen activator (urokinase, uPA) or tissue-type plasminogen activator (tPA) under the control of plasminogen activator inhibitor-1 or PAI-1. High levels of components of this proteolytic system including uPA, its cell surface receptor (uPAR) and its inhibitor PAI-1 have been correlated with a poor prognosis for different cancers. The initial concept for the implication of serine proteases during cancer progression is that proteases degrade extracellular matrix components, a prerequisite for endothelial, inflammatory or tumor cell migration to distant sites. They have also been implicated in the activation of cytokines or other proteinases, as well as in the release of growth factors sequestered within the extracellular matrix. 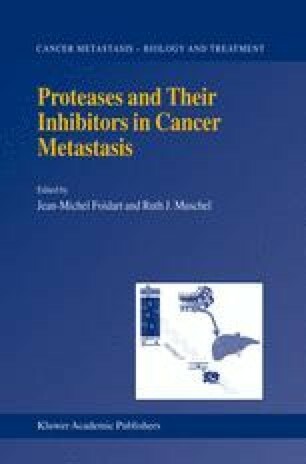 Recent information have underlined the importance of cell-surface proteases, their receptors/activators or their inhibitors in cell migration. This review focuses on the emerging roles of the plasminogen/plasmin system during cancer growth and angiogenesis with a special emphasis on PAI-1.